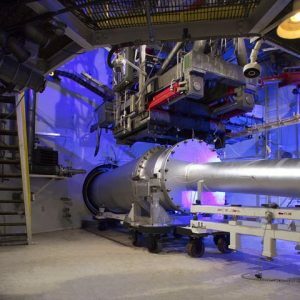 The Hypersonic Tunnel Facility (HTF) at NASA’s Plum Brook Station located in Sandusky, OH, originally designed to test nuclear thermal rocket nozzles, is a hypersonic (Mach 5, 6, and 7) blowdown, nonvitiated freejet facility that tests large-scale hypersonic air-breathing propulsion systems. 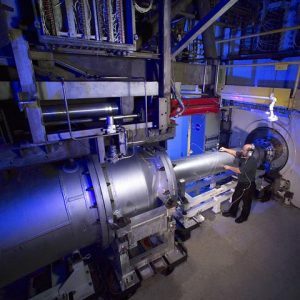 Designed to conduct research, development, and acceptance testing of hypersonic airbreathing propulsion systems, the Hypersonic Tunnel Facility (HTF) is a fully self-contained facility. Its experimental infrastructure includes a shop area for fabrication of materials for facility subsystems and assembly of customer hardware. Due to the high-energy nature of the facility, it is operated remotely from a control room approximately one-quarter mile from the actual facility. to establish the facility Mach number condition of 5, 6, and 7. A nominal free jet test section ‘characteristic dimension’ is the nozzle exit diameter, 42 inches for the HTF. However, the hypersonic core flow varies with Mach number. The test section length can be adjusted from 10 feet to 14 feet in length. Utilization of aeroappliances around test hardware is standard practice. 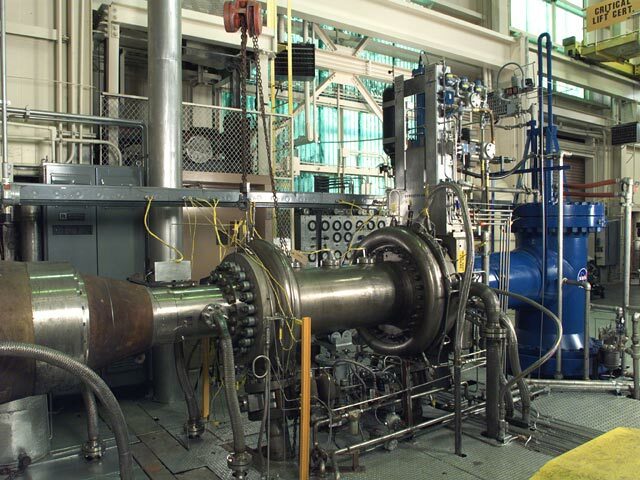 A single stage steam ejector is used to exhaust the facility flow and provide altitude simulation. The facility’s size and long run duration allow for full systems testing of large flight rated structures and propulsion systems. The facility is capable of supporting both hydrogen and hydrocarbon fueled propulsion systems. 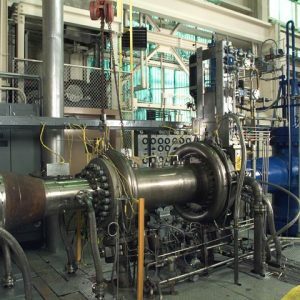 In addition to free jet testing, the use of the facility to support direct connect subsonic and supersonic combustion is currently being developed. This capability would allow for the testing of large scale combustors in a non-vitiated flow. The HTF contains a large stand-alone experimental infrastructure that can be readily reconfigured to test a variety of ground test applications including high-energy, high-risk testing. 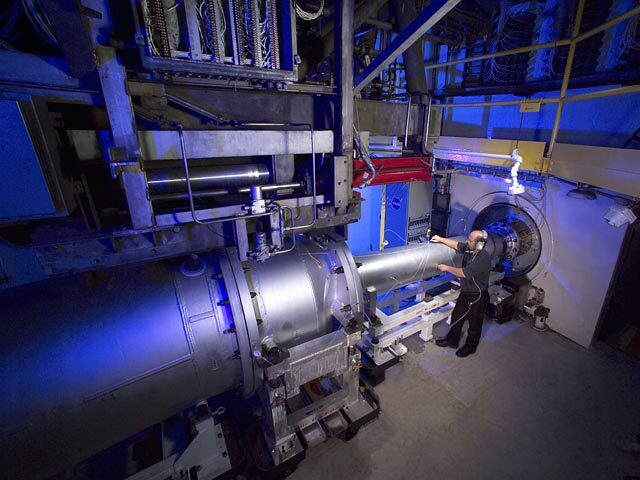 In addition to free jet testing, the use of the facility to support direct connect subsonic and supersonic combustion is currently being developed. The HTF’s size and long run duration allow for full systems testing of large flight rated structures and propulsion systems. Originally designed to test nuclear thermal rocket nozzles as part of the Nuclear Engine for Rocket Vehicle Application (NERVA) program, the HTF was reconfigured as a hypersonic (Mach 5,6,7) blowdown, non-vitiated, free jet facility capable of testing large-scale hypersonic airbreathing propulsion systems. 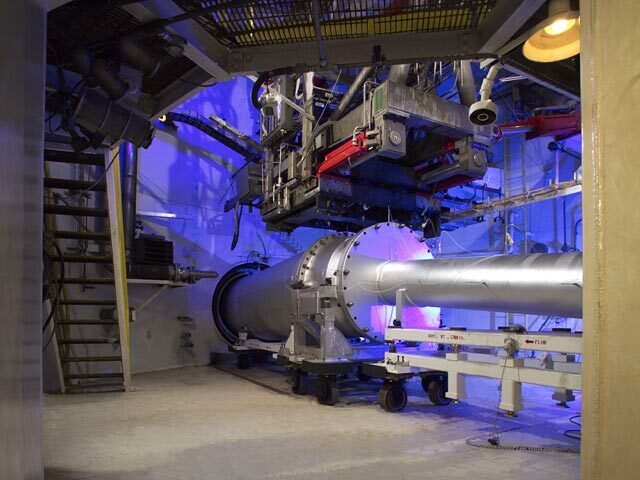 The hot train section with shutter valve located inside the Hypersonic Tunnel Facility (HTF).